ink and Sweet Azalea, Rhododendron viscosum 'Pink and Sweet', extends the season with color since it is a late-blooming azalea. Purplish-pink flowers have a golden flare in the throat and a spicy sweet fragrance. Striking blossoms are set off by deep green foliage that turns red each fall. These sweet azaleas are so well named since they are lovely and very fragrant. 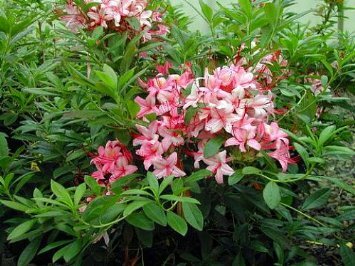 Few landscape plants are more colorful than Pink and Sweet or offer as many opportunities for your landscape. Pink and Sweet performs best in well drained, acid, organic soil that maintains a uniform moisture level all year. It grows 4 feet wide and 3 feet wide.